This Kansas City winter has brought a rollercoaster of weather. Last weekend we were anticipating our second big snow in two weeks, which fortunately bypassed us. Even with the cold rain falling from the sky, we still planned a stop at Betty Rae’s Ice Cream to check out their treat menu. We had been seeing tons of buzz lately about this place, so we figured it was time to see for ourselves. After all, ice cream brings a smile even on a rainy day. One of the main reasons we decided on this place was their offering of boozy shakes. For those of you who are unaware, these are like regular shakes, but kicked up to “adult only” style. When we arrived, we were not prepared for the wide range of ways to sample their small batch ice cream creations. While we stood around gawking at the menu board, we watched a continuous line of customers file by us. Clearly we were the outsiders in our own hometown. Betty Rae’s is the brainchild of David and Mary Friesen. The couple met in college and spent time together scooping up treats to locals at a shop in Columbia, Missouri. While life took them into different careers, their love for creation eventually led them to open their first shop in the Waldo area. They chose to name their business after David’s grandmother, who had a love for the sweeter side of life. 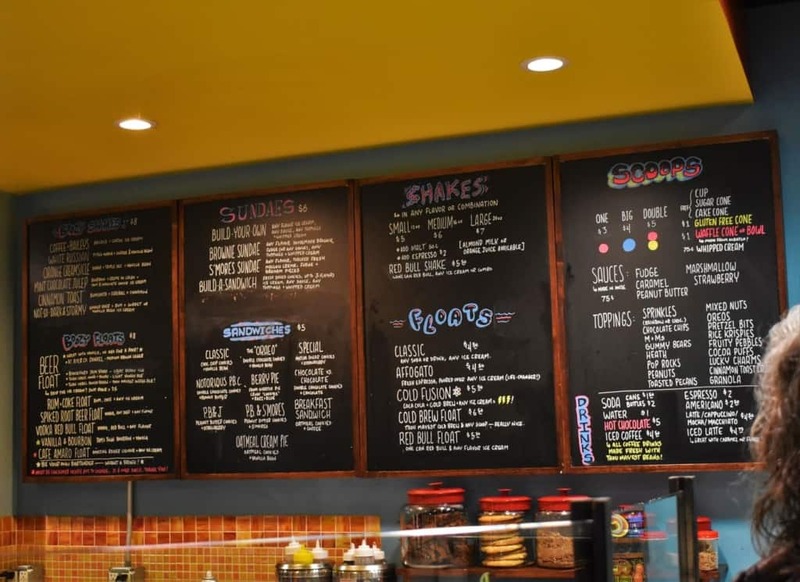 At Betty Rae’s these choices go well beyond chocolate, strawberry or vanilla. As we perused the cases, we saw some unique flavor combinations that made us do a double-take. Being a small batch operation allows them to change up their flavors regularly. While they have a core of fan favorites, like the Lavender-Honey they developed in college, new designs offer regular customers some variety. The weekend we visited, they had just rolled out a special Red Velvet Lemon Chiefscake flavor in honor of our hometown team. We couldn’t pass up a tasting of it, since it was being rationed out to make sure most everyone got a chance. We are hoping that the success of our Chiefs will turn this into a regular featured flavor. We had expected the steady ice-cold rain to mean that we would find Betty Rae’s nearly empty. Boy were we wrong. 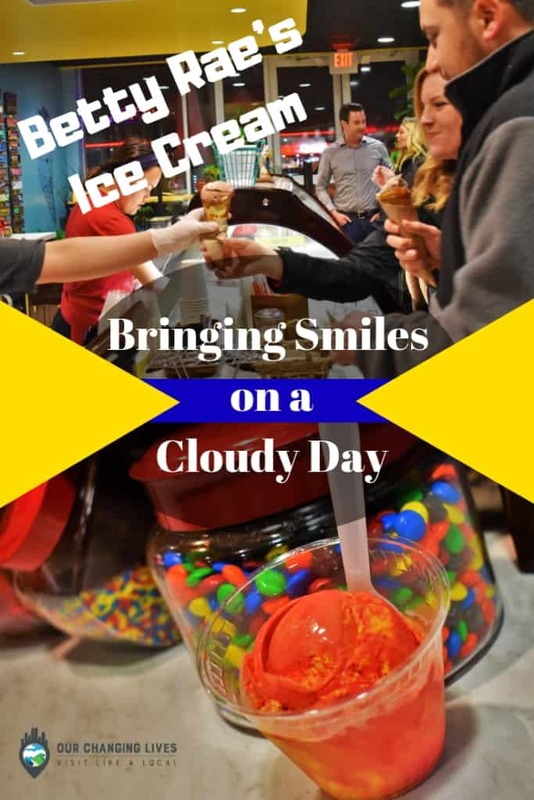 The almost steady stream of customers was proof that ice cream can bring smiles even on a cloudy day. As I moved around the room taking photos, I noticed a common occurrence. As each customer was handed their highly anticipated treat, a smile would spread across their face. This repeated itself over and over, which made it very easy for me to determine a theme for this article. Finally, we made our own decisions on what to order. Yes, at times we can be just as indecisive as everyone else. 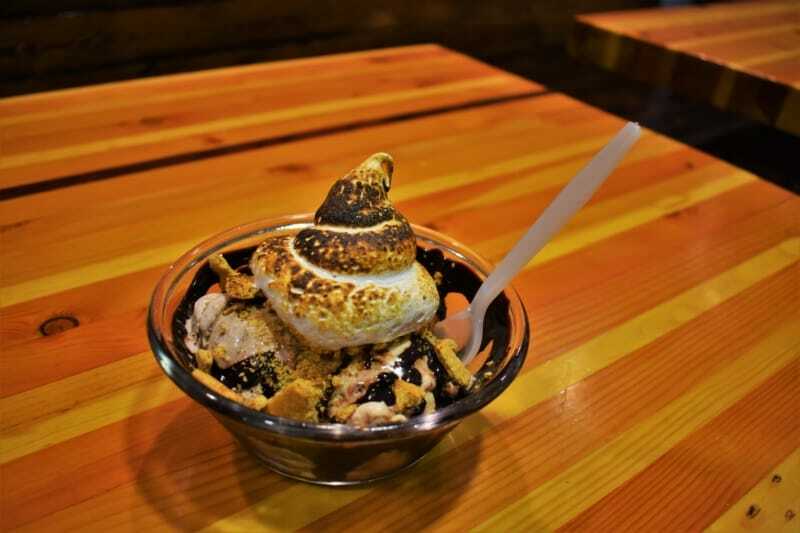 Where Crystal had been gung-ho about the boozy shakes, she turned around and ordered a Smore’s Sundae. It’s hard to blame her for switching, since this masterpiece is chocked full of so many of the flavors that she loves. The base for this creation began with Smore’s, Brownie, and Cookies & Cream flavored scoops of ice cream. (You get to choose your own flavors.) A healthy dose of graham cracker is shoveled on top and covered with marshmallow. A blow torch is applied to create the appropriate charring, and viola! It was left on me to order the “adult” milkshake, so I went with the Mint Chocolate Julep. This intoxicating creation contains scoops of Mint and Chocolate Cookies ice cream that are combined with shots of bourbon and Cream de Cocoa. Plop on a dollop of whipped cream and some chocolate sauce and it was party time. As we sat and savored our creamy treats, we took notice of the space around us. Those who reside in Kansas City know this is an art town. It shows in the roadside sculptures that dot the landscape. Our various art galleries hold collections of marvelous works from artists around the globe. We even have an entire district dedicated to growing new art relationships. At Betty Rae’ s, they have dedicated a portion of space to help foster this creativity in others. Besides the obvious artistic pieces that decorate the interior, there is a small gallery set up for customers to create their own masterpieces. Too soon our magical creations were depleted, and we faced the reality of returning to the cold world outside. The satisfaction from our sweet treats had wiped the gloom of the dreary weather from our spirits and replaced it with a glow of happiness. Once again, we had found a new destination to add to our routine when we need that special pick-me-up. Before we departed, we noticed a small freezer filled with totable treats. Now that we know about it, we can bring the goodness home for late-night tastings. After all, there will be plenty more times that we will need ice cream to bring smiles to our faces on a cloudy day. 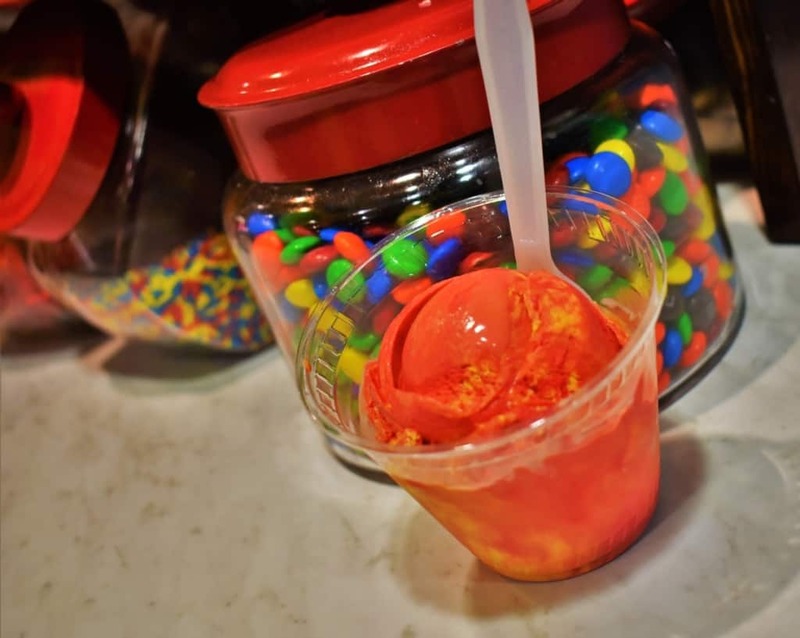 Have you ever visited Betty Rae’s Ice Cream? What are your favorite flavors? Share this with a friend who needs a Smile today! I don’t remember you ever going. I go there as often as I can! It is the best ice cream in the world, at least I think so! I am glad you mentioned the art. It is not only the art from others on the wall, but the decor of the place that screams art! So true. It’s nice that the decor is as special as their ice cream.